The launching activity of this 470-ton steel span over Metro viaduct was a daunting task in itself as this activity was performed during night hours at a height of approximately 16 meters above the ground level. 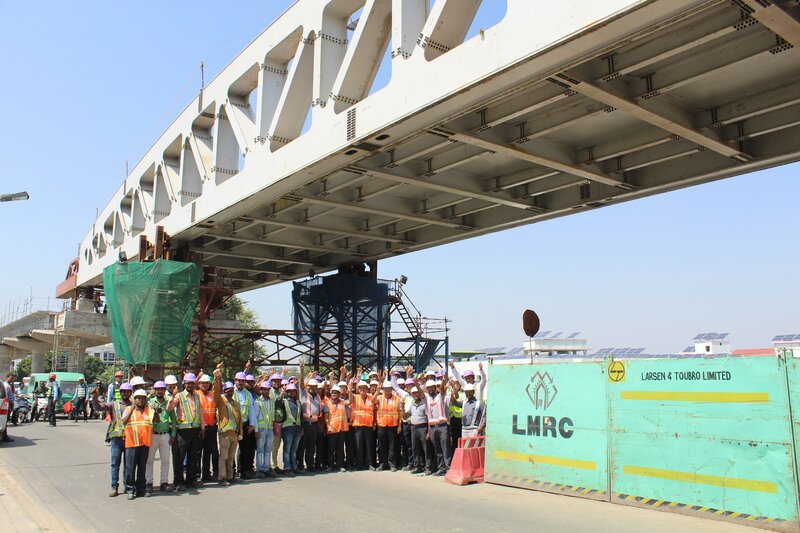 The erection activity for this job was started in the night of 24th September 2018 and the final erection of the 60 Meter Special Steel Span was achieved in the early morning hours of 29th September 2018. During night hours, the launcher was moved or pushed ahead over the supporting trestles with an automatic movement. However, this movement was not continuous as the span could gain only 500 mm of distance in one go considering the trickiness of the job and the heavy traffic movement during night hours. What made it even more challenging was that it had to be erected above the 25000V OHE of Indian Railways without disrupting their operation.